When my Grandmother, Madonna Montran (AKA Donna), passed away in 1976 it was several days before my mother was informed of the death. When she went to Donna’s apartment she found that everything had been removed, the apartment cleaned, and the apartment up for rent already. She was told by the building manager that everything was either trashed or given to the Salvation Army. Well… Not everything. Apparently, Donna’s friend, Virginia Hagen, saved some of the photos and other documents of Donna’s. Those items were put into a trunk and remained “lost” for over 40 years. 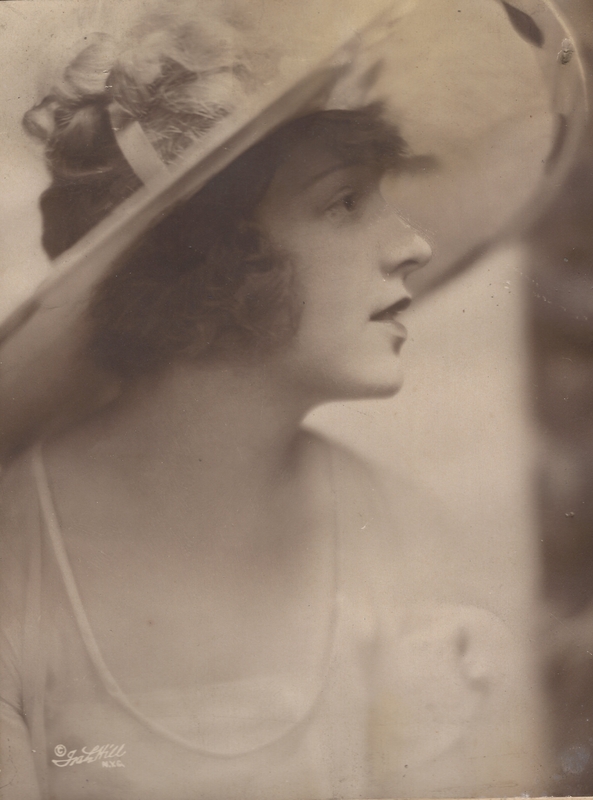 Virginia’s daughter inherited the trunk and searched the internet for information on the “nearly famous” vaudeville star, Donna Darling. (Donna Darling was her stage name.) She quickly discovered this blog site and contacted me. She gave me a chance to digitize many of the items. I was able to digitize 357 images. Some of the images are large photographs, others are scrapbook pages with several articles, and several are groupings of thumb-sized photos. Newspaper clippings from the 1920s in contact with acid rich paper don’t do so well over time. Likewise, many of the photos were glued into the albums causing damage. Additionally, because Donna knew who the individuals were, there was no reason to label most of the photos. Business Card from Amsterdam Hosiery & Gift Shop. There are four sides to this business card, including one side showing birthstones for the various months. I believe this was her ex-husband’s parents shop. Blue Cross Blue Shield identification card for Donna Rossberg. I have never understood her Rossberg connection. This card confirms she used the Rossberg name sometimes but I have never found a legal connection (marriage) between Donna and “Red.” Something to investigate sometime. A 1970 photo of me holding my son, Matthew. Sadly, the photo is badly damaged. A photo of me. I have the same photo in my personal photos and have always thought it was from about 1956. However, Donna’s copy has our Fridley address written on the bask, indicating it was more likely 1958. A 1910 photo of Madonna Montran. At the age of 17 Donna had her first professionally done photoshoot. One of those photos became the picture used on the sheet music of “In the Heart of a Fool.” Another photo from that photo shoot is in this first batch of photos. The original has many scrapes, nicks, and creases. I touched up the image slightly to remove the blemishes from the photo (not from her). Without a doubt, you can see how incredibly beautiful she was. Amazing photo is it posted above. Donna on Ocean Liner, circa 1930. 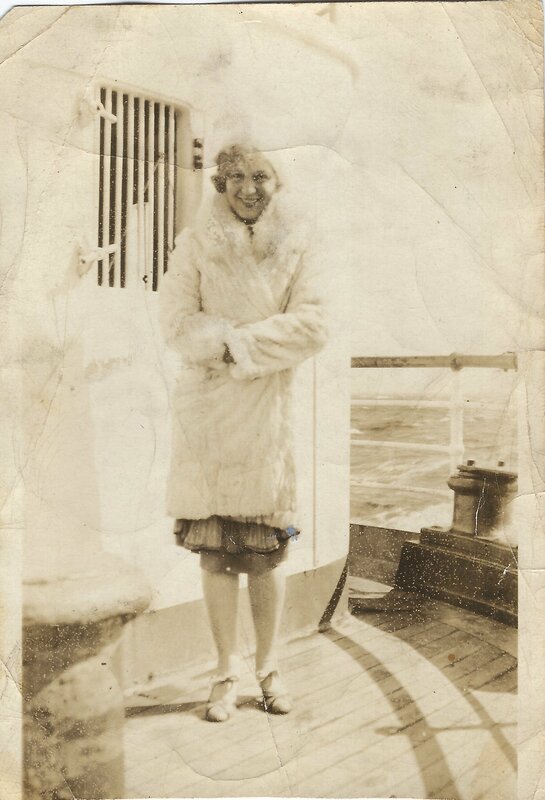 Next is a photo of “Donna on Ocean Liner – Carabean [sic] Sea.” I believe this to be about 1930. Donna and Sammy went to Panama in 1930. While in Panama, Donna met my grandfather. Also, while in Panama Donna and Sammy became estranged. Although they returned on the same ship, they appear on different pages of the manifest and reported living at different addresses. He, his mother’s address in New York and Donna her mother’s address in Detroit. Next is a photo of Freddie Braddock that appears to have been taken in San Antonio, Texas in June 1952. I have no idea who this person is nor what his relationship to Donna was. Another thing to investigate. A 1954 “Honorable Withdrawal Card” from the Laundry Workers’ International Union. I knew that Donna worked in laundries. I also recall her being very pro-union. She said that the rich get rich by exploiting the poor and that unions curb that exploitation. This card really triggers memories for me. I think I should research the LWIU and learn more about this important aspect of Donna’s later life. There were three letters from me. One made me feel bad. It was a letter from me to Donna apologizing for not visiting her when I was in Minneapolis on military leave. I promised her that I’d visit her on my next return home on leave. Sadly, she died before I returned to Minnesota. There is a wedding photo of myself and my first wife. I think it is in better condition than the copy that I have. My son, Matthew, is the subject of a March 1976 photo. He is on the side of a hill. Donna’s Medicare card from 1966. A photo of my mother, Sylvia, from Christmas 1970. 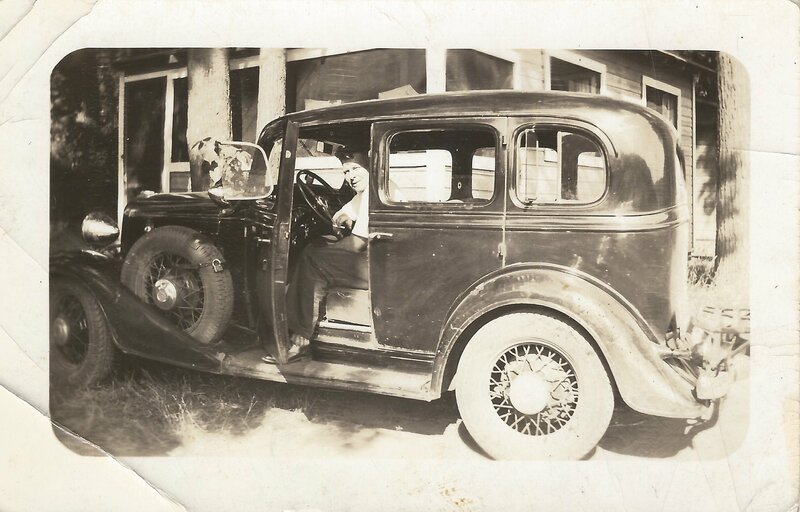 And last, but not least, there is a photo of an unknown man in a vintage automobile. The car has “suicide doors” and odd fold out windows. I don’t know what type of car it is. (But, I’ll bet a car buff could tell me.) I’m thinking it might be Russell Kees (the significant other of Donna, not Donna’s son). I definitely need to do more research in this photo. So, the first ten images yielded 16 items. Only 247 more images to go. This is going to be fun. Many thanks to Norma White and to Valerie Lumley for taking care of the collection all these years. Once again, thank you, Norma White, for allowing me to digitize the Donna Darling Collection. Search again for Donna’s connection to Red Rossberg. Were they ever married? Who was Freddie Braddock and what was his relationship to the family? Investigate and research the Laundry Workers’ International Union. Determine the kind of car it is (below)? Who is the driver? When might the photo be from? Unknown man in a vintage automobile. How is he related? Bless that women for saving all these wonderful photos.